When studying film in college during the Seventies, I read critical books that were about the themes, issues and the craft of movie-making. But by the Eighties and Nineties, most of the books I encountered – good ones, I'll admit – like Final Cut (about the Heaven's Gate disaster), Outrageous Conduct (about the Twilight Zone tragedy) and The Devil's Candy (about The Bonfire of the Vanities fiasco) were more about the failure of the American movie industry. (Ironically, most made for more compelling drama than the films that inspired them.) Now it would be tempting to add John Gregory Dunne's Monster (Random House, 1997) to this ignominious list, but for the fact that it is not much more interesting than the movie that spawned it. Monster initially reads as an absorbing and a painfully comic tale that pits the creative writer, with his unreasonable demands, against the corporate system, one that produces inhabitants who wear pinstripe suits with suspenders, slick their hair back with grease and have Perrier breath. But the book loses its nerve part way through and turns pretty schizoid. If the first half of Monster suggests how Hollywood's corporate brass turn writers into cookie-cutters, by the end, Dunne is practically providing trays to put the cookies on. Monster deals with the eight years it took screenwriters Dunne and his wife Joan Didion to come up with what was to become John Avnet's film, Up Close and Personal (1996), where Robert Redford plays veteran television newsman Warren Justice and who helps Tally Atwater (Michelle Pfeiffer), a star on the rise, find fame while they fall in love. In outline, the book is a field diary of how they tried to negotiate different projects, survive serious illness and witness the death of friends over the time it took to finish writing the film. But Monster also examines how this very formulaic and sentimental movie came out of a very different and contentious story. In 1988, Dunne and Didion were approached to write a screenplay based on Alanna Nash's book Golden Girl, a biography of the late network correspondent and anchorwoman Jessica Savitch. Savitch wasn't just another blond beauty with a talent for the tube. According to Dunne, she was "a small-town girl with more ambition than brains, an overactive libido, a sexual ambivalence, a tenuous hold on the truth, [and] a taste for controlled substances." She would die in 1983 at the age of 35 in a freak car accident. Disney, a studio least likely to show interest in such a gritty story, nibbled at the project first. Through an insane number of rewrites, Dunne and Didion dramatically changed the content, the lives of the characters and the plot trajectory until what remained was a generic love story. It not only did not resemble the life of Jessica Savitch but instead looked like a template of their botched screenplay for the Streisand/Kristofferson version of A Star is Born (1976). What makes Monster so bizarre is in their acceptance of the travesty they had to make of their work. It's like watching people gleefully turning into the pods from Invasion of the Body Snatchers. Michelle Pfeiffer and Robert Redford in Up Close and Personal. Dunne makes clear that if it hadn't been for a 1988 screenwriters' strike that cancelled all other projects, they would not have been committed to Golden Girl. And if it hadn't been for heart surgery he needed, along with the medical insurance, they probably would have abandoned the project when it started to get out of hand. Nonetheless, he still seems too pleased with the final result. But for Michelle Pfeiffer's intuitively crafted performance, Up Close and Personal seems to betray the very nuanced elements that attracted them to the Savitch story in the first place. 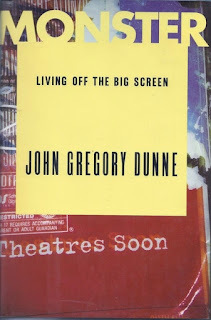 What John Gregory Dunne comes face to face with in his book is a real monster – the Hollywood corporate machinery and the creatures it creates. By the end, though, he deludes himself into thinking that it was all just a mirage. If truth be known, I think the monster swallowed him up.